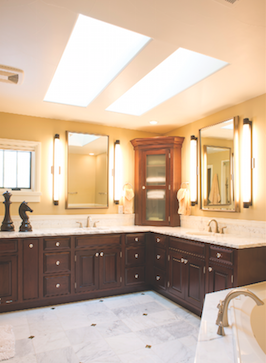 When it comes to proper lighting, one of the most critical rooms in the home is the bathroom. It’s most often the first place people go to when they wake up in the morning, and it can set the mood for the day. The bathroom is where you wash and groom, and many people take their morning medications there—all strong cases for optimized lighting and daylighting. The other reason is that light, particularly daylight, is what sets our circadian rhythms, which play an important part in overall health. Helping people see well is also critical for safety, since the bathroom is where 80 percent of older adults experience a fall. Fortunately, good lighting for seniors is good lighting for everyone. Let’s look at seven opportunities for the best bathroom illumination: daylighting, overall light, vanity lighting, lighting over a tub, light in the shower, lighting at the water closet, and night lighting. How much light is needed in the bath? The answer depends on the person and the task they’re performing. For someone just waking up and shuffling in to the water closet, 10 footcandles (fc) might be plenty. After a shower, when it’s time to shave, 100fc is probably needed for better visibility. 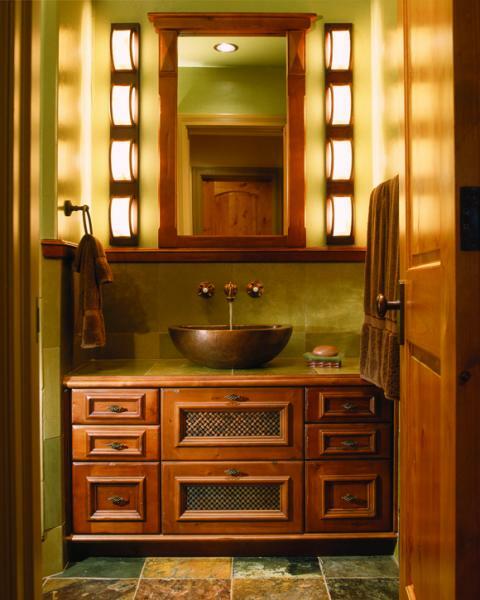 In the master or guest bathrooms, use fixtures that provide at least 75 to 100 watts of illumination, says Randall Whitehead, a well-known lighting expert and author of Residential Lighting, a Practical Guide. You can also get these light equivalents in a 24-watt fluorescent or a 20-watt LED, he adds. (Note: A 100-watt incandescent bulb yields 1,750 lumens, or about 137 footcandles). This 1970s bath in Westminster was landlocked and compartmentalized. By opening up the wall between the two spaces and bringing in a tubular skylight from the roof, the room has been for transformed. For the first time in more than 40 years, daylight reaches this bath. A pair of wet-rated can lights over the WC and tub, and double sconces on either side of the vessel sink provide task lighting. All fixtures are on dimmers. An oversize mirror and light color palette help to visually expand the space. The remodeler was Reconstruction Experts and the interior designer was Andrea Lawrence Wood. 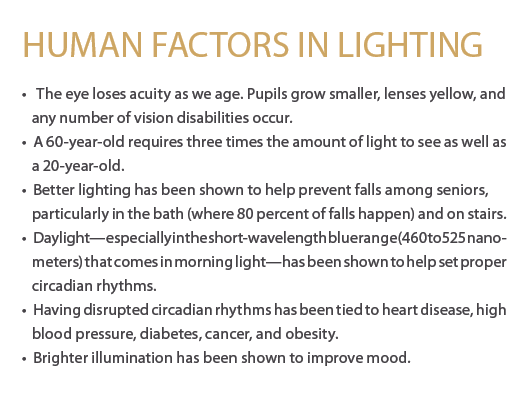 Lighting educator Phil Richards, of Juno Lighting Group, in Chicago, has a simple rule of thumb for determining lighting needs: “It’s whatever your client’s age is, plus 20.” So a 20-year-old would need 40fc, while a 70-year-old needs 90fc to see equally well. This is because the eye’s pupil size reduces and the lens thickens and yellows with age, letting in less light. But what about when the 70-year-old doesn’t want 90fc or is bothered by glare? The best way to solve that is with fixtures that mask the actual light source: either up-lights, deeply recessed downlights, or lenses. Dimmers can also be enormously helpful. It’s far better to “overlight” a space and provide dimmers for making adjustments than it is to underlight it. With two, three, or even four circuits of lighting and dimmers, there’s a vast variety of possible combinations. Nothing beats natural daylight for brightening your mood and setting the circadian rhythms that regulate wake/sleep cycles. There’s a huge and growing body of scientific literature around this phenomenon. 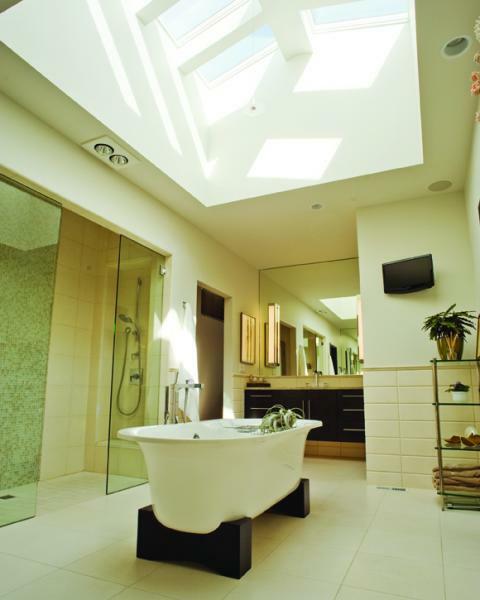 That’s why it’s ideal to design a bathroom with as much natural light as possible. If planning to include one window, why not have two?—especially if they can be on adjacent or opposite walls to balance the illumination. To circumvent the common issue of large windows over the tub that are always covered to provide privacy, why not switch to bottom-up shades so you have daylight and views with privacy? As part of a new pop top in Denver’s Bonnie Brae neighborhood, this new master bath provides a wraparound vanity for both partners. Since it’s on the north side of the home and the small window is more for ventilation and a bit of view than for illumination, most of the light during the day is provided by the two north-facing skylights. During the day, one doesn’t even need to reach for the light switch. For more reliable all-day lighting, how about adding a skylight? 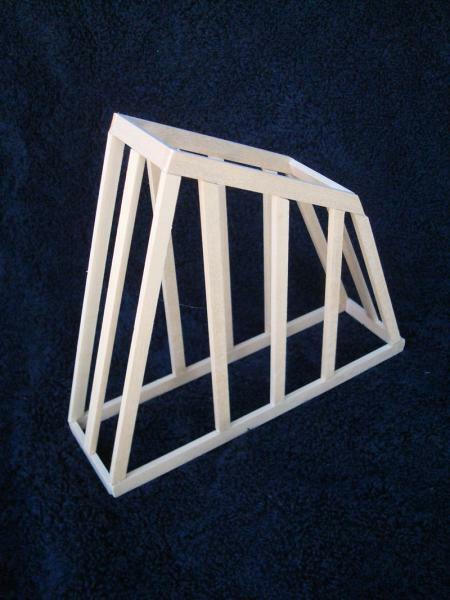 A 2x3 skylight lets in two to three times the illumination as a same-size window. Light levels of 100fc to 200fc are quite common in skylit spaces, even on overcast days. And although one skylight is a great improvement, we often include several in the design to fit the space and add drama to the ceiling. This is how we like to see a single skylight framed—not a straight shaft on four sides, but with one or two of the sides splayed to spread the light. We’ll set the skylight low with a plumb side coming down and splay the upper side to fill the space. In a trussed roof, you only get to splay two sides; if it’s a stick-framed roof (usually pre-1960), you get to splay all four sides if you want, and that’s quite interesting. Another great product for overhead illumination is the tubular daylighting device (TTD). Available brands include Solatube and Sun-Dome, among others. The TTD is a small acrylic skylight with a 10-to-14-inch tube, polished on the inside, that delivers an unbelievable amount of daylight to the room via a lens at the ceiling. TTDs cost less than $1,000 installed and are even available with a built-in LED light to provide illumination at night from the same lensed opening. Want more? Check out our story where we totally reconsider recessed kitchen lighting. Many homeowners like the luxury feel that a chandelier or pendant fixture can bring to a space. To prevent code issues, make sure that the fixture is at least 3 feet from the tub and 7 feet or more above the high-water level. In addition, put it on its own switch, with a dimmer. Depending on the layout, this might be the fixture used in the middle of the night, and it’s best if you can dim it to about 20 percent. Another great ambient light source in baths is indirect up-lighting, usually achieved with fluorescent or LED light strips on top of cabinets or a soffit. This is particularly soft, pleasant background illumination. 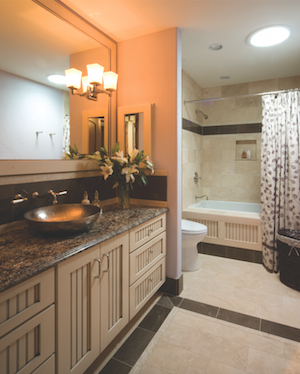 For effective bath lighting of any sort, it’s smart to pay attention to the CRI (color rendering index). A number of 100 is ideal but hard to find. Anything over 80 will allow people to see colors fairly accurately. Finally, don’t forget to specify the color temperature, expressed in degrees Kelvin (K). A 2,700K lamp is about the same warm yellow light as an incandescent bulb, and many clients prefer them. Jumping up to a 3,000K lamp makes a whiter light, still warm, that’s a good compromise. For residential use, 3,500K is about as cool a color as I’d recommend—it’s particularly good in closets, where you need accuracy for color matching when choosing clothing. Many clothing stores use 3,500K lighting for that reason. The best possible lighting for activities in front of the bathroom mirror comes from fixtures mounted on either side roughly at the user’s eye level. This leaves no part of the face in shadow, as happens with an overhead fixture. If the mirror wall isn’t an option, move the light fixtures to the side walls, or hang pendants from the ceiling; just try to get the light to either side where it will do the most good. To provide a range of lighting from dim to bright is why we prefer to use LED (or incandescent, if the client absolutely demands it) rather than fluorescent, as LEDs are much easier to dim. It’s better to have fixtures that can over-deliver lumens and be dimmed as needed. And even though they still sell “Hollywood” light bars in the big-box stores, try to refrain from using them, especially with clear bulbs, as they produce glare and leave shadows under the brow, nose, and chin. If the space doesn’t allow fixtures on the sides, it’s OK to place one over the mirror. Just try to select a linear model with a continuous band of bright light. Downlights are perhaps the worst type to use for task lighting in the bath, although they are fine for ambient or accent lighting. Also, downlights are usually incandescent, which is the least energy-efficient form of lighting-—only 10% of the energy used by a typical incandescent bulb comes out as light, the other 90% is wasted heat. Building codes are very strict about lights over tubs and whirlpools. There can be no open or hanging fixtures within 8 feet above the tub, nor for another 3 feet in front of it. Since most bathroom ceilings aren’t more than 8 feet tall, this generally precludes having open or hanging lights above tubs. Lensed damp or wet-rated downlights work, or you can use spotlights placed outside the “danger zone.” If ambient light levels are high enough, there’s probably no need for a dedicated fixture for the tub. Some high-end whirlpools are available with (code legal) underwater mood lights for romantic effect. Usually we try to locate tubs under a feature window or major skylight, as they are the focal point of the bath and are where one wants to spend time relaxing. Daylighting makes the most sense at tubs. How to balance a client’s need for privacy with her strong desire for daylight? By looking up and grabbing a piece of the sky. That’s what we did for this Denver Country Club contemporary, when faced with an outside wall that was 10 feet from the neighbor’s windows. 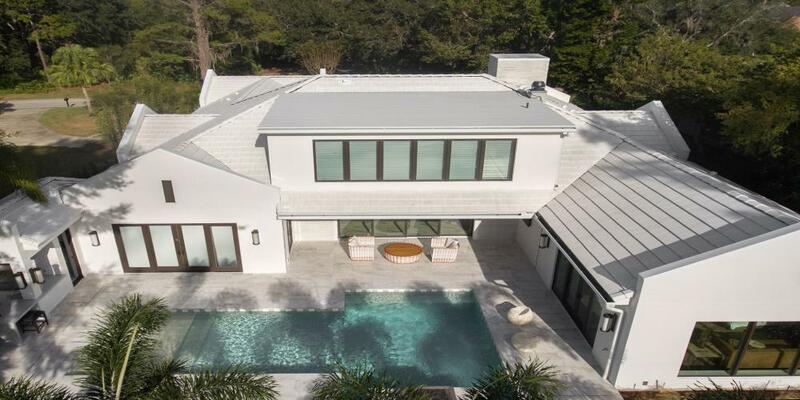 A roof monitor houses eight skylights, making the bathing experience “like taking a bath outdoors,” the client says. Great news for people who don’t like showering in the near-dark: There are any number of very bright, open shower trim lights available, which means you can put in cans that punch light down and dim to the desired level, instead of struggling to see with the standard-for-years lensed 60-watt maximum cans. We used to put two, or even more, cans in a shower just to get decent lighting; now one good one can do the trick. Gasketed glass or acrylic surface-type fixtures rated for shower use are also available. Want more? Check out our top lighting products for 2017. This is most easily achieved with a fan/light combination fixture. If the customer wants more light, perhaps to read by, we’ll specify an additional recessed can light in front of the water closet, almost always on a dimmer. Another good trick is to “borrow” daylight via a frosted-glass door or transom windows that allow light but preserve privacy. For every rule, there is an exception. 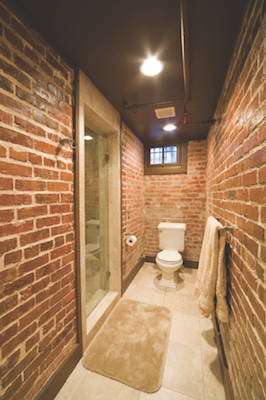 Although light colors are best for increasing light levels, under the old plaster in this basement bath, contractor Mike Garner discovered handsome dark-brick walls, which we wanted to feature. We painted the ceiling a dark brown to obscure the few pipes that we couldn’t hide up in the ceiling—much as restaurants sometimes leave a busy ceiling open but painted black. But then we deliberately chose a light porcelain tile to maximize spread of the light from the recessed ceiling lights. Since the bathroom is sometimes used in the middle of the night, it’s critical to provide some, but not too much, light by which to safely maneuver. When the eyes are adjusted to darkness, as they are when waking up from a sound sleep, very few footcandles are needed. (A full moon is just .01fc!) Flipping on bright overhead lights will be blinding and disruptive. A 5-watt nightlight may be just right. Therefore, it’s a good idea to provide a low-wattage light source that either is on all night or that responds to motion. Many exhaust fan/lights have such a feature, or you could wire some step lights in the wall, or simply purchase some plug-in motion-sensor nightlights. High-end hotels sometimes feature LED tape lighting under a vanity or a countertop edge for this purpose. In most of our higher-end work, we provide an electrical outlet behind the toilet for a bidet seat, and this is a perfect place to plug in one of these lights. Recently, several manufacturers have started offering LED lighting in the toilet seat for wayfinding. This article is based on Doug Walter's presentations at KBIS 2015, the National Kitchen & Bath Association’s annual conference and expo. My wife and I are getting the lighting redone in our house. Our bathroom has always seemed so dim and we've been wondering what to do to make it look better. A lot of the things you mentioned never really occurred to me. I'm definitely going to look into installing shower light fixtures, for example. The shower and vanity lights both seem like brilliant ideas, no pun intended. Hopefully we can find a good service to redo the lighting soon! Thanks for the post, Doug! Tyrone: glad you found useful tips in the article. Just make sure you've selected a WET rated can for the shower to be legal. Any chance of a Solatube in there for daylight? Many clients for whom we've spec'd them report not having to turn on a light at all during the day. That's true that I don't want the lighting to be too bright when I first wake up. Maybe we should have dimmers installed so we can control the lighting in our bathroom a little better. We definitely need better vanity lighting at least. It's hard to see very well to do my makeup in the morning sometimes. Really agree with the author, bathroom lighting does matter a lot. Especially for ladies who love to wear makeup. Like some people said they don't want the lighting to be too bright when they first wake up, but actually at the end of the day you really need bright lighting for wash-up. Re-installing the lighting system is not an easy thing. I recently found that the LED mirror is a good solution for this. I use the mirror light in the morning, and the mirror light+bathroom light at night which helps to see a lot clearer than in the regular mirror. Great tips. I am a huge fan of LED lighting. These little gems have given way to countless option to light up a bathroom. Ive never seen them under the lip of the vanity so thanks for that idea! Perfect bathroom lighting is very important for us. These are awesome tips about bathroom for example 5-watt nightlight may be just right. That's true bathroom lighting should not be more bright. BRBD Sons is the best led lights distributors in Delhi. My 1/2 bathroom is 4X10, I want to use a LED mirror that is rated at 600 Lumens, will this be enough light for this area? Gary, without seeing the fixture I can't say for sure, but I have a strong suspicion it will NOT be enough light by itself. But if you also did a recessed downlight over the sink it would be. Most LED backlit or edge lit mirrors I've seen give out a very nice, soft light, but not enough for critical shaving or make up tasks. (For comparison, a halogen 60 watt bulb puts out 565 lumens, and if doing a typical bath sconce over the mirror, we'd use a double fixture, with 1130 lumens total. If you really need to see what you are looking at, more lumens are better. A decorative ceiling light is also a desirable add for the room. If it was a 3/4 bath, I'd also add a wet-rated can in the shower for safety's sake. Our bathroom is being remodeled and it will be white (white wall tiles, white med cab, white countertop, light grey floor tiles).. It will have a large 6' x 3' window next to the vanities. We are looking at Verdera integral lights med cabs and Robern AiO med cab. The first ones come with 3000K LED lights (1300 lumens) the second ones with 2700K or 4000K and 750 lumens. The ceiloing will have recessed lights 3000K in a space of 12' x 6' . We are 65 years old and would like natural light from the med cab. because we have placed an order recently for AiO 2700K, and I am doubting about its color, I write to ask for advice. Do you think that Aio 4000K is too cool? should I change the order to Verdera 3000K. many thanks!. Pat, apologies for this late reply. I don't get a notice when a new comment has been submitted on this 4 year old article; I only know about them when I happen to revisit the article on the site. Color temperature is very much a personal preference, from 2700K (the color of an incandescent bulb) to 4000 (approaching daylight). My personal go-to is 3000K, which I find to be a pleasant neutral white. Ideally the lighted medicine cabinet would be equipped with LED's that can change color depending on the time of day, or your preference. They make undercabinet lights like that. I hope you chose a color you are happy with, because you'll be living with them a long long time. Thanks for writing in, and sorry for the late reply.